Oak View is a small town located roughly between Los Angeles and Santa Barbara, 10 miles from the Pacific Ocean, this is a very beautiful area, lots of hills and trees. This picture shot in the middle of the wine farms tells it all : simple, scattered buildings among the trees, the quietness under the scorching sun, and these sort of big fishing nets to provide some shade on what I call the open workspace and the press protected by a tarpaulin. A magic place. Adam Tolmach who created the Ojai Vineyard is a relatively long-time player in the California wine trade, he began to make wine with Associate Jim Clendenen in their common project, Au Bon Climat in 1982, both being trained in Burgundy, and then he came back to his family land and started his own label in 1991. His wines there were praised by the critic Robert Parker and were selling well but in a rare move for such a successful vintner he said that his wines had become way different from the wines he liked, too high in alcohol, too powerful, and that he didn't drink his own wines. Trapped by the critic high scores and the resulting success of his wines, he had let the alcohol of his wines slip to 15° and beyond. So in 2008 he announced a significant shift in that regard and changed dramatically his approach in terms of vineyard management, picking dates and vinification in order to come back to fresher wines with lower alcohol, and this he said, without watering the juice or using reverse osmosis, which are common practices in California. Adam Tolmach being away when I visited, Fabien Castel, who is a Frenchman and the right-hand man of Adam, walked me around and helped me discover the winery. Oak View near which the wine farm is located is about 10 miles from Ojai (pic on left), a nice small town with Spanish colonial architecture and lined up with an impressive mountain range and a nice vegetation. The property sits on a remote corner of the Ojai valley and the GPS was again useful to reach our destination. Fabien Castel (right) with assistant winemaker Dominic We first sat down in the shade under the trees for a quiet chat, this visit took place in july and the sun was not forgiving. I had spoken with Fabien over the phone from France and from further north in the U.S. and here we were at last after a long but thrilling journey. Fabien explains how Adam Tolmach and Jim Clendenen met while working at the Zaca Mesa winery which was a very early winery in Santa Maria and they started Au Bon Climat which was located in Los alamos then, south of Santa Maria. All the while, Adam Tolmach had begun plant vines on his grandfather estate here in Oak View, and when he parted from Au Bon Climat in 1991 he started his own winery here, planting more vines on his family land. He had made the first plantings as early as 1979 which make now relatively old vines, and most of them where Rhône varietals because that was what he liked and made him known for, with grapes like Syrah, Grenache, Mourvèdre, Viognier and Roussanne, while at Au Bon Climat they were more on Burgundy varietals, Pinot Noir and Chardonnay. But on the whole Ojai Vineyard is making wine from purchased grapes sourced in the region around here, offering between 20 to 24 separate bottlings every year. There was no other winery around here when Adam Tolmach opened shop in 1991, except Old Creek Ranch which was then a small operation with an old building dating from the prohibition. Since then the wine landscape changed in the region, and in Ventura many new wineries have opened in the last 5 years. Fabien landed here 12 years ago after a very meandering path, leaving France doing sailing, then staying in French Guyana, then Brazil, Bolivia where he met his American wife, living first on the east coast, then eventually coming to California (Ventura) where his wife was from. He had been interested into wine while working in restaurants in Philly and looked for employment in the field in California, The people he contacted all sort of said Adam Tolmach was the man to visit for that and he began to work for him, doing the cellar-rat jobs, and learning all the while with Adam. He did a bit of vineyard work at the time but now that's finished because they have sub-contractors who do the job, so he was soon doing only cellar work, and later sales. It's still a small operation here and they share the job. The barrel building Fabien says that what Adam is standing apart in the wine trade because of his strong personnality first, and because his drive and motivation is different from the business-minded one which you find in most wineries. Much of the wine industry is driven by profit and money, making a successful business, and while Adam wants his winery to succeed, he's not putting profits before authenticity. He has refused to grow in size because in his mind it was antithesis of quality winemaking. He wants also to further explore the different varietals the Rhône, the Burgundy wines, and also recently he's getting interested in Riesling, Sangiovese, possibly Gamay and Roussanne too. 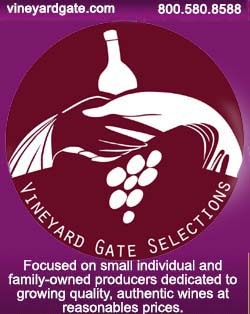 To be sure to have the best-suited farming for his grapes, he has been very early purchasing them by the acre and not by weight, which is good for the farmer and allows the vineyard to yield the best quality fruit unimpeded by volume issues. He can this way for example keep the irrigation moderate when on vineyards paid by volume the grower is tempted to over-water his crop. Asked about the different types of irrigation practice by growers, Fabien says that dripping can vary a lot from place to place, even under similar climate. Adam has often underlined for example how growers want vineyards that look green and prolific, they can't come to terms with having a vineyard that looks suffering, when it's precisely a struggling vineyard which will offer the best grapes. Adam understood early that a vineyard has to be kept on the edge, which means using very moderately the irrigation. Most of the vineyards they work with are organic or close to organic, and that's why paying by the acre and at a good price is important for the grower. Right now there has been some cases of pierce disease that needs some tobacco-derived treatment and that's an exception in their organic push. Evan, doing some barrel checks as we were tasting a couple of wines in the cellar, we saw Evan who is doing the cellar-rat job here, pretty much like what Fabien when he first worked in this winery. He doesn't know yet if he'll keep working in this field but he's learning. The area around here has a unique positioning of mountains, hardly found elsewhere on the West Coast, with east-west oriented mountains and the native chumash tribe who was living here had undestood the unique properties of this situation for the local micro-climate : there is a very cooling influence coming inland thanks to this east-west mountain range, keeping cold air in the hot months deep inland. Elsewhere in California the cool fog is blocked by the north-south mountains but here it can flow along the valley inland, making it today a precious ally for vineyard growing. With a wide range of exposition and micro-climates for their contracted vineyards, their pickings go from late august to mid october. Also an interesting thing is that many vineyards they work with had never been farmed before, and in some soils they get very good phs and good acidity. Sometimes like for the syrah in 2005 they could push the ripeness way beyond they should have and still have very low ph, yielding a good tension in the wine. __ Ojai Chardonnay Bien Nacido 2012, recently racked into a vat and bottled 3 weeks later. It had never been racked before, the white staying on lees from 11 to 15 months. It'll be fined and possibly filtered because the malolactic is not complete. Asked about the SO2 he says that there is usually a small adding prior to the fermentation when they don't do a native fermentation, as there's some exploration on this issue, Adam planning to have batches on native yeast and others with lab yeast. Otherwise after this SO2 adding there is nothing until bottling, and at bottling there will be 17 to 20 free SO2, and for reds it is much lower including sometimes no sulfur adding. In the barrel room __ Ojai Sauvignon Blanc 2012 McGinley Vineyard (see map). The wine has not the cat-pee typical sauvignon nose, it's more floral with tropical notes. The grapes are usually early in the morning or at night, and the fruit arrives cool because the nights are cold here, the grapes are put into the press (the big Europress under the tarpaulin), then the juice goes settling naturally into a vat, then into barrels after a couple of days. The malolactic is blocked here, using lysozyme, an enzyme derived from egg white, in order to keep the sauvignon crisp. Adam began to make sauvignon very early when nobody would make some, especially that a sauvignon sells for less compared to the reds. __ Ojai Pinot Noir Santa Barbara, a blend being recently made a batch from Kick On vineyard, another from Bien Nacido young vines and a third from Solomon Hills Vineyard, the three regions being in cool climate. the color of the wine is relatively light, there's a tiny bit of sweetness in the mouth, but it's balanced and gets down well. Fabien says that just a few years ago the pinot was more rich and high in alcohol. Fabien says that Adam worked a lot in the early years of the winery to maturities that were even (they were often disparate because of poor management of the vineyard side, before) and one of the undesired result was wines with a higher alcohol level, and a few years ago he worked to correct that. From 1998 to 2003 he made wines from over-ripen grapes and after that he decided to make changes that materialized in 2005 and from 2008 it really showed up in the wines. tHen Fabien says, mother Nature gave them two incredible vintages, 2010 and 2011, two magic years with a fresh climate which made it easy to have a ripenness with low alcohol. In the last years, Adam reduced the extraction, scaling down the pigeage, doing things with care on the winemaking side. __ Ojai Pinot Noir Bien Nacido young vines (2012), this is one of the components of the previous blend. The young vines have more energy, these are Dijon clones, the old vines being American clones, Martini clones, the latter bringing roundness and the former (the Dijon clone) bringing the energy part. Dominic says that these young vines were vinified 40 % whole-clustered as an experiment. Very nice wine. Before that Adam didn't use the stems because it was too herbacious but since 2005 he reintroduced stems, sometimes only 5 or 10 % but it yielded good results. Adam does a lot of things separate so that he can blend the resulting wines or not. He also makes sometimes 2 pickinngs in the same vineyard whenthere's an uncertainty about which optimal picking time is, and keeping the 2 batches separate, he's going to follow the resulting wines and decide later what to do in regard to the picking time. For example for such a picking experiment made in 2005, he got the answer 7 years later in 2012 when they compared and tasted the 2 wines : picking early was definitively better. __ Ojai Pinot Noir Kick On vineyard 2012. Aged from 17 to 19 years. Speaking of yeast, they let the fermentation begin on native but usually finish it with added yeast because otherwise it can last a long time and stall. This wine has a nice dusty nose, Fabien says also powedery notes. In the mouth there is also this sugary side, with a velvety side also. enjoyable drink. They used to pick at about 26 brix and now between 22 and 24,5. Fabien says that here they don't have rain or hailstorm problems, but their worry is certain winds like the Santa Ana wind, it's a desert wind and if it blows on the grapes it dries everything, raising the sugar concentration. The challenge here at Ojai is to pick before such an event, if there is a warning ahead, in order to save the acidity and the freshness. __ Ojai blend of Grenache and Syrah (50/50) 2012, Sebastiano vineyard (Santa Rita Hills), sulfure free. Grenache is partly whole-clustered. the nose is not very expressive, the mouth feel and swallow is a very nice experience, there's still this sugary side but I guess very different result from the same wine with SO2. Here too they're going to bottle the two versions side by side, the customers being able to see what they prefer. It's not really fizzy but there's a hint of something in that rergard. Dominic says that that's why he loves working here because these experiments are very enriching. They found that in the wine without SO2 the texture is superior versus the other version, but on the other hand the aroma become a little better when they had SO2. [That's very interesting, and I understand why some people prefer the wines with SO2 and reject natural wine, this could be because they have a wine experience and a training focused primarily on aromatics when natural-wine amateurs are more focused on the non-aroma mouthfeel aspect, the swallowing experience and the liveness in the mouth - only my hypothesis]. Fabien says that in his opinion this is not the case (the loss in aromas), this wine is so fresh and so aromatic, and at this point he says it's obvious that the wine doesn't need any SO2. There is the raspberry of the grenache, the mouth is gentle, it's very exciting. He did tastings with trained tasters and always, the wine with a little SO2 was preferred by the tasters because the nose was detailed and precise, but on the other side the mouth was harder, more angular, while the no-SO2 wine had a more muted nose, and then in the mouth it was just this extraordinary feel, this incredible texture, salinity, this verve and lack of seperation with the different elements. I again agree, I think that the mouthfeel (and I always add swallowing) experience is usually very exciting on wines made without any SO2 addings. Climbing among the barrels Still, Fabien says that to make a wine that ages, it's important to add a bit of SO2, at least for certain varieties like for example the whites or delicate red varietals. For Syrah it's no problems, the tannins help protect the wine along the years. TFor the others, just a little bit of SO2 may help them age 20 more years. __ Ojai Syrah 2012, from Solomon Hills vineyard, from a barrel. Nice dusty nose feel. Very cool climate, says Fabien, this is a place where there's also pinot and chardonnay, plus this tiny parcel of syrah, on sandy soil. Nice wine, with encense notes and a thin glass-paper feel forv the tannins. Will stay another year or two in barrel. The alcohol here is very low here, about 12,5. __ Ojai, Syrah (Estrella clone) plus 5 % viognier, from the vineyard in upper Ojai (hot climate), from a cask. A more powerful wine, more fruit and concentration but it's only the climate, it's picked actually verty early, end of august (the previous wine was picked mid/late october). 14,5 ° alc. Actually this wine is the one through which they get the most praise on the market. I touch with the finger here the gap between different approaches and tastes regarding wine. Fabien says that this year they made half of this wine without sulfur, because the tannins keep it secure. I really love this space __ Ojai Sangiovese 2012, from a barrel, sourced from White Hawk vineyard (north of Los Alamos). Sandy soil. Fabien likes it because it has the funky side of Italian wines. Huge acidity, intense feel, here. That's why the aging is important for these Italian wines. He's been tasting many Italian wines and he's in love with their many indigenous varieties. He says that what's sad in France it's that after the phylloxera the number of varietals has been dramatically reduced, even though some people revive little known grapes like Trousseau or Pineau d'Aunis; he says that some poople embarked near here on planting Trousseau and himself is having plans to plant some for himself. I have to say that fabien was the one who advised me to visit Arnot & Roberts months ago, when I called him from France for this trip, he's very friend with them and follows what they're doing closely. He says that they visited Ojai 7 years ago and always remained in contact since because they were on the same vibes, exchanging cases of wines every year. He considers them as being apart from the crowd, they're also into making Gamay which is a pioneer thing here in California. The 2nd mouth of this wine, several long minutes after the 1st sip, is really very nice and exciting, plus you feel all the substance in this unfiltered wine, and as I tell this to Fabien he says that this wine is also made without SO2. Like often in America, the tasting room is separate from the winery, the customers don't drive here (thanks God, otherwise there would be a parking lot and a paved road all the way to this gem of a valley), they go to Ojai where they can both purchase the wine and taste (6 wines are available for tasting), and they sell 200 different wines when you count alqo the different vintages. Fabien says that the wines without SO2 sell faster than the ones with, and as I ask if Adam will decide to increase the share of non-sulfured wine he says yes, they're already on that path. They began in 2010, the 1st separate bottling being in 2011, and now they got 2 and 2012 and either 2 or 3 in 2013, and the back label will say "no added sulfites". The lab Picture above : No, this is not a fallout shelter and Adam Tolmach is not a survivalist or member of a militia, it's just a former water tower or water tank that was converted into a lab for the winery. It stands a few meters from the wooden buildings and that's where they do some storage and lab data collection. This is wxhere the winemaker organizes his logistics during harvest, some sort of field command room. __ Ojai Riesling Kick On vineyard 2011. Speaking of the prices, they go from 18 $ to 56 $ but through the wine club (which you find in most American wineries) the first price is 14 $, the customer having to buy 8 bottled per year. This riesling is a cool-climate riesling, especially that 2011 was even cooler than 2010, and they even got some noble rot that year. This is an atypical year, especially that they had almost 2 such years in a row. As I ask how other vintners regard these cool years, Fabien says that he had a video interview made by wine critic Antonio Galloni (Galloni also issued this july-2013 applauding report on Ojai) where he discussed this issue and he said that for them at Ojai these were the two best vintage they had, but many people were afraid because they thought they wouldn't get the maturities they used to and they tried to get it. Many were worried thinking that their wines woukd be meager but 2 years later they were surprised by what the found. Fabien adds that Paul Lato (interviewd by Galloni in a video) says something very interesting about these two vintages : they were vintages, he said, where the work in the vineyard was put forward, and when the growers had made a good job on this side they didn't have to wait for the maturity. __ Ojai Chardonnay Bien Nacido vineyard 2011 -Santa Maria Valley (pic on left). Good tension, refined wine. The wine is filtered but the mouthfeel has the fullness on a non-filtered wine. Fabien says that the filtration is light, and they take attention to the details, the racking conditions, the presence of gas in the wine, and this counts a lot too. 350 cases in total. The biggest cuvée is 800 cases, it's the Syrah Santa Barbara County. __ Ojai Chardonnay 2001 Talley-Rincon vineyard. This is the year when Fabien began to work, Adam was already working on the acidity issue, but 35 % was in new oak. Vanilla side with spices, cardamon. We're speaking of Adam and Thierry Allemand and Fabien says that they followed a similar path, they managed to make their own thing without being hostages of banks. __ Ojai California Table Wine rosé 2012. Made with Grenache from Sebastiano, plus 2 % of white : Riesling and Chardonnay. Nice texture, clean, straight mouth. 13 ° alx. Harvested early, although a red, at 12 ° potential. Evean, in the lab Here they collect and the data about the sugar, ph, va and then SO2, they also check and file the turbidity of the wines, and they enter all this data so that they can follow all their wines, because if they have 20 different wines they're originally from 40 ot 50 different parcels or lots. It helps keep track along the years of what happened for every situation and terroir. They're doing the bottling with a service company which is doing a terrific job, Fabiensays, it's Mission Bottling, they're very efficient, they do the right steps for the wines without SO2, they use no chemicals they just steam the bottles. __ Ojai, a red, no label : a sulfur-free, Syrah 2002 White Hawk vineyard. They just made a dozen bottles of this wine, without SO2, they just filled the bottles without racking the wine and left it as is. The rest got its usual dose of SO2. At that time they used to do lots of pigeage like 3 times a day, 6 hours between each, when today it's once a day. The nose is complex here. Mouth : intense, extraction but nice aromas of dry bushes and dust, not cooked fruit. The feel is 14,5 alc. (no label). in 2003 and 2004 Adam still pushed the maturity. This wine got only a bit of SO2 on the incoming grapes, 30 ppm when now they do more like 12 ppm on the grapes (makes 1,2 or 1,5 gr). I must say that the dishes prepared by Fabien's wife Uldine were possibly the best things I ate during this whole trip, with if I remember lots of small herbs and ingredients, very tasty, very refreshing, comes shoulder to shoulder with Charlene and Vernon Rollins's food in Talent, Oregon. __ He brought also an Ojai Sangiovese 2012, White Hawk vineyard, a neat wine with a nice minerality. Ojai Vineyard exports about 10 % of its wines, to Sweden (Divine) and Japan. Adam Tolmach went to Japan for the first time last winter, and with his former associate Jim Clendeden and he loved it.